Conferring with Sen. Michael Baumgartner of Spokane, who is chair of the Senate Commerce, Labor and Sports Committee. The Legislature provided a short break in action last weekend, which allowed members to travel back home to their districts. It was great for me to meet with people, provide updates on legislation, and enjoy some 12th District sunshine. While at home I met with a group of constituents in Wenatchee – mostly educators – to update them on the Senate’s education-funding proposal and the recent bipartisan passage of the Senate’s bill to address the “levy cliff,” a scheduled reduction in school levies beginning in 2018. The passage of this bill defers that reduction for one year while the Legislature continues to address comprehensive levy reform this session. The visit back home also provided me the opportunity to attend the Memorial Service for Wilfred Woods at the Numerica Performing Arts Center and the celebration that followed at Pybus Market. Everyone involved did a fabulous job. It’s only fitting that Wilf was able to once again bring our community together even in his passing. 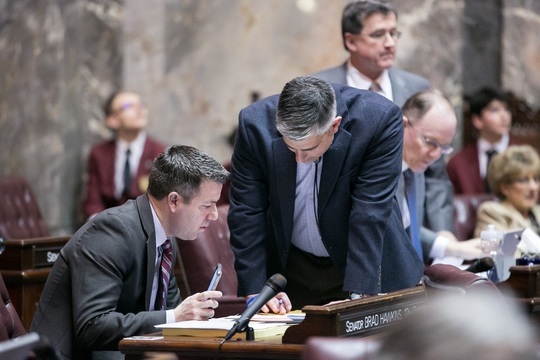 After returning to Olympia, the Legislature swiftly got back to work on a variety of issues. When most people refer to the state budget, they often think of the operating budget that covers most of state government’s core services, including education and public safety. But there are two other budgets which are important in their own right. The capital budget really should be called the construction budget, because it is about physical assets: public buildings, parks, land acquisition and more. The third budget is for transportation projects and also funds the Washington State Patrol. We adopt new budgets in odd-numbered years, when the regular legislative session is 105 days long. Typically it is the most important responsibility we have, although the need to reform the funding of K-12 education is just as important this year. These budgets are biennial, meaning they cover two years, but we adjust them at the midway point to account for cost changes we couldn’t anticipate, like wildfire costs. These adjustments are supposed to take less time, so the regular session in even-numbered years is limited to 60 days. I say “supposed to” because at this time a year ago the Legislature’s regular session was over, but we had been called into a “special” session to iron out disagreements related to the operating-budget update. I hope that doesn’t happen this year. As a member of the Senate Transportation Committee I will be involved in the first stages of the 2017-19 proposed transportation budget. I expect it and the new operating and capital budgets will be available for review soon. Click here to listen to my latest interview with KOHO Radio for more about the budget process. Legislators who draft the operating budget need to know how much tax revenue is available to invest in services and programs. The best estimate comes from the revenue forecasts prepared by the state’s non-partisan chief economist and approved by a bipartisan council representing the legislative and executive branches. The forecasts come out quarterly, and the first forecast of each year gives budget writers the most up-to-date numbers available. The first forecast for 2017, adopted this morning, anticipates a $256 million increase in revenue for the 2017-19 biennium – meaning budget writers have a quarter-billion dollars more to work with. Our Senate budget-committee chair described the forecast as “very positive” and is confident that the next state budget can be balanced without new revenue – meaning he sees no need for new taxes. Historic revenue growth in current budget – The 2015-17 fiscal biennium, which ends June 30, is expected to bring in $39 billion in revenue, compared to $34.3 billion in the previous two-year budget cycle. That equals 13.6% revenue growth, the highest in more than a decade. This level of revenue growth has triggered a provision in the state constitution that means over $500 million of the revenue growth must be deposited in the constitutional “rainy-day” fund. Largest projected reserves in state history – State government’s balance sheet now projects $2.4 billion in reserves by July 1, when a new budget takes effect. A healthy reserve can only help government to live within its means, and that’s good for taxpayers. Reason to be cautious going forward – The 13.6% biennial revenue growth for 2015-17 is expected to slow to 6.8% for the next budget cycle, which is another reason to control spending. Between policy bills and several policy-related resolutions, 913 pieces of legislation were introduced in the Senate this year. About 31 percent received approval from a majority and were sent to the House for consideration. Those 283 measures include the five bills I introduced. Senate Bill 5270, which would make DNR’s contract-harvesting program permanent, is scheduled for a vote this afternoon by the House Agriculture and Natural Resources Committee. Senate Bill 5508, my bill to allow two-year vehicle registrations, received a public hearing yesterday from the House Transportation Committee and is scheduled for a vote next week. Senate Bill 5546, my bill to assess and treat the health of our forests – to reduce our risk of “megafires” – is scheduled for a public hearing this afternoon before the House Agriculture and Natural Resources Committee. Senate Bill 5649, which would allow Okanogan County to form its own Regional Transportation Planning Organization, was approved yesterday by the House Transportation Committee. Senate Bill 5720, my bill to help settle pay issues involving workers in the tree-fruit industry and other agricultural sectors, isn’t yet scheduled for a public hearing in the House – but a delegation of growers from our district is scheduled to visit with me and House leaders next week to discuss the bill.